Barclaycard presents British Summer Time Hyde Park takes place on the Parade Ground on the East side of Hyde Park. The postcode of the event is W2 2UH. 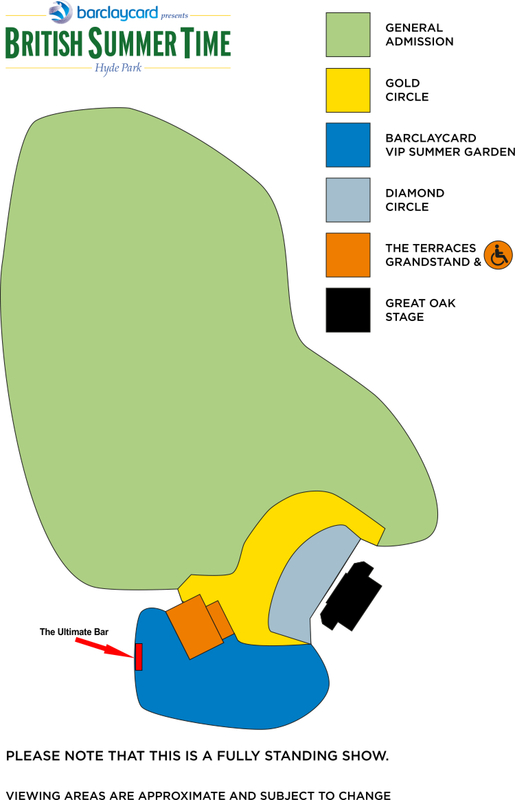 Please refer to the Royal Parks Map. The central London location of our event means that we are well served by the public transport network and as part of our sustainability plan BST urge you to use public transport where possible or even walk. Use TFL’s Journey Planner at www.tfl.gov.uk and check which entrance applies for your ticket type closer to the event. BST recommend that visitors avoid coming by car as there are limited places. Pay and Display parking is available on West Carriage Drive and in Car Parks at either end of Serpentine Bridge. Hyde Park was created to satisfy a royal passion for hunting. But over the years it became a place where people have pursued many other pleasures. One of London's finest historic landscapes covering 142 hectares (350 acres). There is something for everyone in Hyde Park. With over 4,000 trees, a lake, a meadow, horse rides and more it is easy to forget you're in the middle of London. There is no official drop off/pick up location at Barclaycard presents British Summer Time Hyde Park due to congestion, so it is best to plan a location away from the event site. Please note that North Carriage Drive is closed for the duration of the event and Park Lane may be closed for a short time at the end of the major ticketed events. BST recommend that visitors avoid coming by car where possible.